We were on a waiting list for 9 months before we moved into our two-story home. We would like to have waited for a flat, but were advised that the wait for them is much longer. So... we settled. We have 3 bedrooms upstairs. We decided, however, to keep our closet downstairs. It started because of our weird schedules. My husband leaves for work around 3 o'clock in the morning. This does not lend itself well to picking clothes. So we actually put both our clothes (and Spencer's) in the downstairs closet. Its a good size closet and it just seemed easier than going upstairs to change, too. Eventually we moved Sasha's clothes down here. Inevitably, we'd find ourselves downstairs mid-day, needing to dress her to go out... but not wanting to climb the stairs to fetch an outfit. Maybe it is strange to use a big coat closet as a family closet, but you know what? It works for us. Our master bedroom closet is used for storage of things we don't use very often (like holiday decorations). This makes laundry so much easier! The dirty laundry gets cleaned downstairs. How much clean laundry do you tote back up your stairs? For me its only bath towels and family cloth! Yes, I have a dirty clothes hamper downstairs... I can stash it in a closet or on the washer when I have company here. Since then, I've taken it another step. I often have to wear Spencer while preparing Sasha for bed. Worse yet, sometimes I have to leave him alone (asleep) downstairs while I take her up to bed. It makes me nervous. Spencer is pretty quiet when he wakes. When Sasha got a new toothbrush from the dentist, I got an idea! I now keep a toothbrush and floss on the kitchen windowsill. Her hairbrush is also downstairs in a plastic jar full of headbands and "hair doodies." (I always brush and braid her hair before bed.) So now, I do almost all of Sasha's bedtime routine before we ever go up the stairs! It is so simple, why didn't I think of it sooner? Go potty - yep, have one downstairs. Brush teeth - see recent post. Brush hair - the back of the couch is the perfect height! Then we go up, pick a snuggle for the night, talk about dreams, tuck in and start relaxation CD. It all seems like it gets less battle, too! Living simply for the win! How have you taken unusual measures to simplify your life? Great idea! It wouldn't work in our house but then we don't need it to, although on the days when my children really don't want to get dressed and we need to go out it would be a great solution! I have this wish for a huge laundry room that can also double as a family closet. It would be so much easier to contain everything in such a manner. Clothes would immediately be folded and put away as they were finished drying. There wouldn't be stray clothes around the house. Add in enough room to store out of season clothing and hand-me down clothing, and I think I would be very, very happy with it. 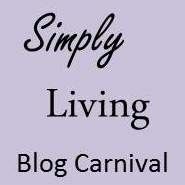 Thanks for joining us for this month's Simply Living Blog Carnival! That would be perfect, wouldn't it? Instead, our laundry room doubles as the downstairs half-bath. Its very odd. Oh how I find houses with multiple floors tedious... You always have to run up if you forget things (says the person who just bought a house with three floors). Sadly this is not really an option for us as we do not have any closet space at the ground level.